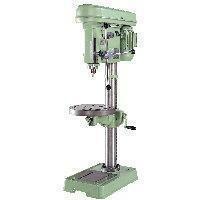 Drilling & Tapping Machine(manual)(SY-25T) - Chen Fwa Industrial Co., Ltd.
Long history: Since 1963 "CHEN FWA" supply precise & uality machines through continuous research. Specialize in manufacturing automatic, Labor-saving drilling & tapping machinery. Adopt reducing speed equipment with high torque at low speed , and high & low speed can be easily changed. Operates for drilling & tapping only need to switch. Can be mounted multiple spindle head to increase efficiency & products unique.